The city of Boston is gearing up when it comes to startups and funding them. It is the second most popular and favored startup funding hub in the recent times. The venture investment in this area has reached $5.2Mn in this year only. Boston startup such as biotech-heavy startup haul is now second only to the Silicon Valley ventures. While Boston does not get noticed often, it is definitely one successful place when it comes to creating and establishing successes with startups. Let’s understand what makes Boston an excellent place for the startups. Boston has a lot to offer to the startups, which includes an incredible regulatory environment and high quality of life for the startups. Here we will discuss why startups in Boston is the most preferred land. The venture capital per capital invested in Boston is only second to that invested in California. The city is known to attract a lot of the startup investors, mostly high value and highly invested ones. The reason being the status of Boston being the startup hub. A lot of super angels and other angel groups have set the space for seed funding as well as industry-focused funds. The city is renowned for its innovation and the interest to drive new arenas and bring in new opportunities to the end users. The tech giants and the medical centers are driven towards innovating the spaces with technology, energy, culture, politics, and healthcare. The early stage startups are also scaling faster, and are all set to hire the staff for the expected growth. There is a collaboration among the entrepreneurs, which allows the startups in Boston to innovate and create better technologies, and business products. There is a sound ecosystem of support in Boston. The incubators and accelerators in the ecosystem can always provide the early stage businesses with the ideal setup, which helps them build and grow. The talent pool that you need to scale businesses is easily available in the city of Boston. You will get people at the base of the pyramid as well as people in the key management areas to help you grow your business, and establish your presence. With the right tools for innovation and the ideal people to fulfill your needs, you will make it to the top if you are settled in Boston. Veo Robotics: The idea of this startup is to give the robots eyes and brains, which will help them connect and collaborate with the humans, for a safe working space. PlacePass: The startup connects the travellers with over 1,00,000 heart-pumping activities across the various spaces. PathAI: The company has recently raised $11Mn in series A funding. The aim of the startup is to help pathologists diagnose diseases faster and with greater accuracy. Kensho Technologies: With over $67Mn funding acquired by the startup, they aim to combine natural language search with graphical UI to help answer complex questions with greater simplicity. NewStore: This is a mobile retail platform with mobile first tools and strategies, aimed to improve the retail experience for the mobile customers. HomeTap: The idea is to make home ownership affordable, with home equity partnerships, which allows the owners to sell portions of their homes in order to gain funds. This is basically a great way to fund your existing income. Buoy Health: Using AI, ML, and other proprietary technologies, the company will help with real-time and accurate analysis of the diseases you are suffering from. BrainSpec: The company will help make an efficient, accurate and non-invasive diagnosis of the brain disorders. Here’s a view into the venture capital activity in the land of Boston. 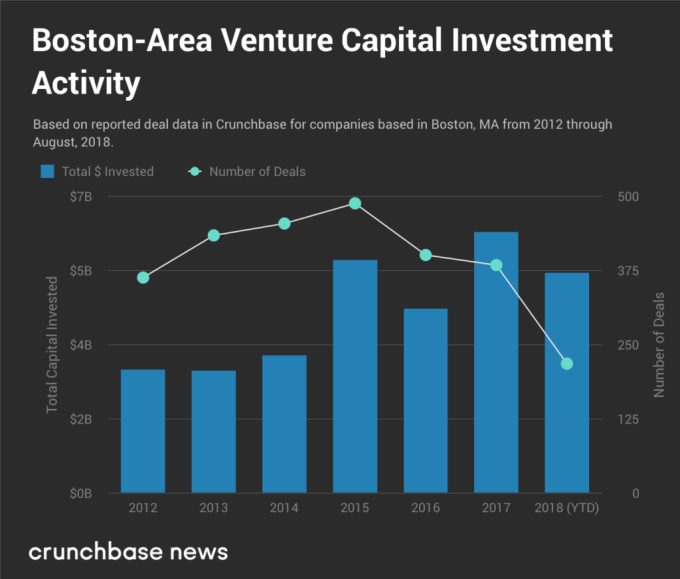 From the graph, it can be deduced that the total per capita investment for Boston has been higher during 2017, and it is already heavy in 2018. If you compare the Boston investments with NYC investments, you will see that the Boston investments are higher for this year. 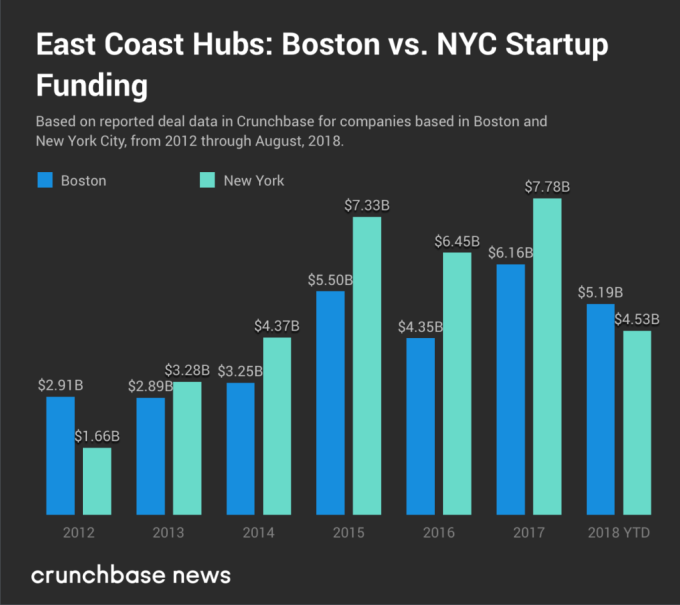 Over the past five years, Boston startups have been slowly catching up with the NYC ecosystem, and are slowly acquiring more funds and innovating more as compared to the NYC startups. If you see the graph for 2018, you would realize that the city is getting heavy funding. For one, the heavy investment in terms of time, effort and innovation made by the city in Biotech is reaping results. Moderna Therapeutics, the developer of the mRNA drugs, received $625Mn funding in the last two consecutive stages of funding round. Here are a few companies that raised a good amount of money in 2018. TraceLink raised $60Mn, which is a life science supply chain company. Boston is a heavily growing startup market, with potential and extreme levels of competency. Coruscate understands the market and knows the needs of the customers of this market. We will help you gain the attention and acquire customers in the market by providing just the level of tech support and offer the tech stack that you require. With an in-depth knowledge of technology and the market expertise, we are your ideal tech partners. If you have a startup in Boston and need to scale it, connect with us for technology support and services.